M. Piper lives in Southern Illinois with her family of 4. She is the only female in the house (if you don't count the poor dog) and enjoys reading and writing in her spare time. Let's face it, though, with two boys under the age of 5, there isn't much free time. 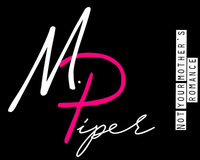 To ask M. Piper questions, please sign up. M. Piper voted for Wasted as Best Romance in the Opening Round of the 2018 Goodreads Choice Awards. We’d love your help. Let us know what’s wrong with this preview of Control by Piper Frost. 1- It's original. Not many authors so brazenly approach the subject of cheating, depression, self-harm, and substance abuse. Bra-fuc*ing-vo Frost. Done with class and sass, this storyline will make you uncomfortable but it is WELL worth stepping out of your comfort zone for. Because Justin. And Ian. And...well you get the picture. 2-This isn't your cookie cutter romance. It's edgy. It's raw. No, you're not going to get the typical 'happy ever after' with two characters fighting for their own little world, but that's right there in the synopsis of BOTH the books so far. What you get is something more a little 2018 and less 1998. Where three people realize love between the three of them is as destructive as it is beautiful. The only question worth asking isn't 'when will so and so realize so and so is the only one for them?" It's "how much more F*CKING hot can this bok get?" Because it can. And I believe when that third and final book comes out...it will. We’d love your help. Let us know what’s wrong with this preview of Addict by Piper Frost. We’d love your help. Let us know what’s wrong with this preview of Afterglow by Maria Monroe. We’d love your help. Let us know what’s wrong with this preview of UnStable by M. Piper.